Trinity Chiropractic and Laser Centre is located in the Old Brew Plaza on Taylor Drive at 119, 5301-43rd Street, Red Deer, AB. 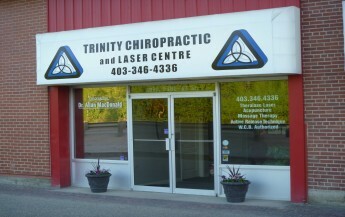 At Trinity Chiropractic and Laser Centre our team is dedicated to “Helping you to Achieve and Maintain Your Best”. Trinity Chiropractic and Laser Centre has been helping Red Deer and Central Albertans with their health issues and wellness goals since 2003. We are here to help you with sports and work related injuries, motor vehicle accident injuries and repetitive stress pain. We provide services to people of all ages. We are a family practice with a focus on the neurological, spinal and muscular systems of the body.